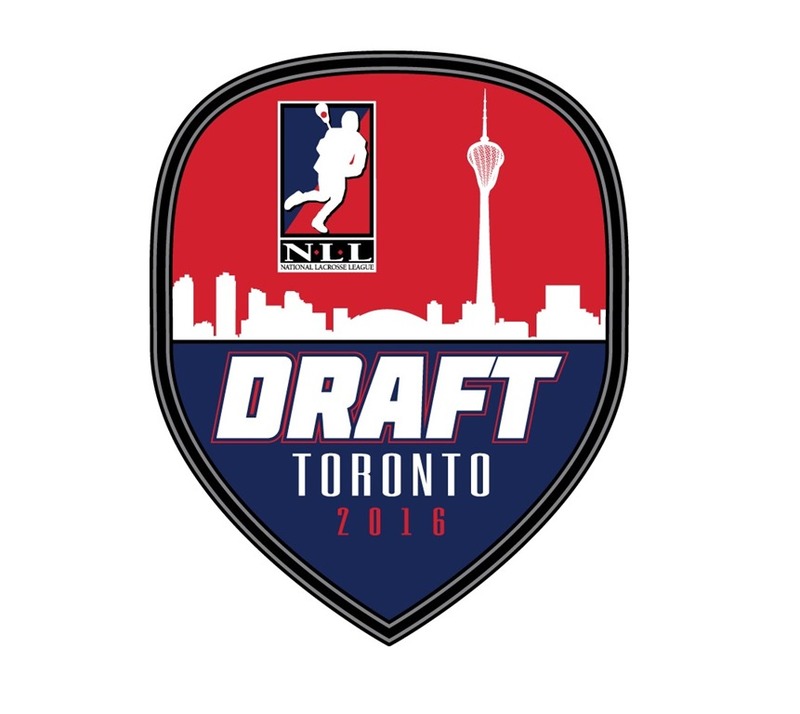 I was able to attend the NLL entry draft once again this year. It’s certainly fun to see all the players, coaches, GMs, media people, and the commissioner in one place, but it’s really cool to watch the players get drafted and see their excited parents, siblings, and girlfriends. I could watch it on the live stream, but it’s fun to be there in person. Unfortunately, I won’t be able to be at the TRAC tomorrow for the awards ceremony. I have nothing much to say about the players drafted since I’ve never seen any of them play, with the possible exception of any Burrards or Chiefs from the couple of Mann Cup games I went to. This article is just about the draft itself. In previous years, Andy McNamara and Stephen Stamp gave their opinions and insight in between picks while Claude Feig briefly interviewed each player chosen. This year, it seemed that Stamper and Andy’s insight was reserved for the webcast and there were no interviews at all. In between picks, it was awfully quiet in the building. But it turned out that it wasn’t supposed to be that quiet – by the end of the first round, they had fixed the audio problems and we could hear Stamp and McNamara. Feig was not around, but Mia Gordon was interviewing many of the players (though we couldn’t hear her). I was sitting directly behind where she was doing the interviews, so I managed to get some screen time as well. I took a couple of pictures with my phone but they didn’t turn out well at all so I stole the draft logo from the NLL site. I just noticed that the CN Tower is a lacrosse stick. As usual, the TRAC was hopping, with a bunch of chairs on the floor itself and some people in the stands too. By the time the show got underway, most of the chairs were taken so I’m glad I got there early to grab one. And also as usual, Jamie Dawick and the TRAC people put on a professional show with a video board listing all the picks in the current round (though a bigger font might have been nice) and once the audio problems were fixed, the sound was good as well. I obviously didn’t see the web feed but I didn’t see anyone tweeting about problems with it. There were a bunch of wifi networks available, with names like “RochesterColorado” and “GeorgiaBuffalo” and such, as well as three TRAC ones and a couple of “NationalLacrosseLeague” ones. Alas, they were all password protected. A bunch of Rush players were sitting right next to and in front of me – Matthews, Rubisch, Corbeil, Lafontaine, Knight, Sorichetti, and some other kid. I saw that other kid looking pretty nervous and taking a few deep breaths right before the first pick was made, and then once Ryan Keenan’s name was announced, he stood up and walked to the front. I don’t know if he was nervous because he didn’t know whether he’d be picked first or if he was nervous because he did know. He gave a little thank-you speech, which I think was also new. He’s now at least the second player to be drafted by his father, after Curt Styres picked Brandon a couple of years ago. Josh Sanderson was once taken by his father Terry in an expansion draft, which kind of counts. OK, one actual lacrosse-related comment. There were a few trades on the night, only one of which included a player and not just picks. 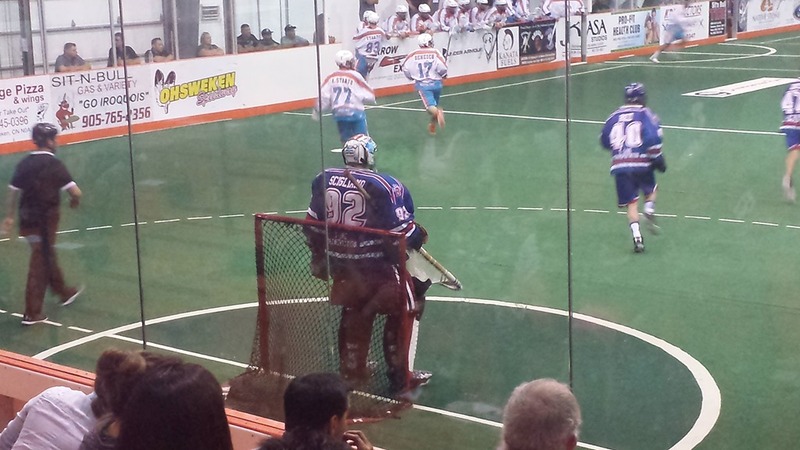 The Bandits sent a second round pick to the Knighthawks for Brad Self. Self is up for Transition Player of the Year at Tuesday’s awards, and all he’s worth is a second round pick? I’ve rarely disagreed with Curt Styres on lacrosse moves, but I wouldn’t have made this one. I know nothing about Dan Lomas, who the Knighthawks chose with the traded pick, but if the Knighthawks are lucky, he’ll turn out to be as good as Brad Self is now. Then again Self is 35, so perhaps they figured after a year or two of Lomas learning the ropes, he could be really good for ten years or more, so the long term gain will eventually offset the short term pain. But for a team that missed the playoffs last season and may be without Cody Jamieson for all of next season, adding more short term pain may not have been wise. There was clearly no “what are we going to wear?” email going around the Rush camp. Chris Corbeil and Kyle Rubisch (and Lafontaine, I think) each wore a suit and tie, while Mark Matthews was wearing green denim jeans and a hoodie. Adrian Sorichetti and Curtis Knight split the difference – jackets but no tie. I don’t always pick this up from watching on TV but some lacrosse players are BIG people. Mark Matthews is huge. Jim Veltman isn’t that big but he’s very tall. I was surprised at how big Glenn Clark is. I didn’t see Dan Dawson there this year but I saw him at last year’s draft and he’s massive. You can read “6-foot-5” in however many articles you want but until you’re standing next to someone that big, you don’t really realize just how big that is. Almost didn’t recognize hipster Jimmy Quinlan with the bushy beard. It’s no Iannucci, but getting there. This is going to make no sense to anyone but Steve, but thanks to Steve Bermel for the peanut butter. It seems a little silly to post my game 3 report after game 4 is finished, but damn that was a great game, so I need to post something about it. The biggest surprise of this game was the announcement of the scratches for the Chiefs. Stephen Keogh? Really? Who the hell are they bringing in that’s so damn good they decided to sit Keogh?! Oh, Cody Jamieson? OK, well, I guess that’s acceptable. Still, there are a bunch of other people I’d have sat before Keogh. After being pulled early in the third period of game 2, Dillon Ward looked sharp early in game 3, but Frankie Scigliano also looked good. The goals alternated almost all night – Six Nations scored, then Maple Ridge, then Six Nations, then Maple Ridge, … until the Burrards scored with less than four minutes left, giving them the lead. They held the lead for all of 2:11 before the Chiefs tied it. The game was tied at 1, 2, 3, 4, 5, 6, and 7. The Chiefs took a lot of shots (they led the game 55-29 including outshooting the Burrards 20-9 in the second period and 19-9 in the third. But they didn’t really test Scigliano much in the first two periods; an awful lot of those shots hit him square in the chest. The Burrards did the opposite – they didn’t hit Dillon Ward much at all, they kept shooting high and wide and a lot of their shots hit the boards instead. Their shooting got better in the third quarter but so did Ward. I didn’t take any pictures at this game, so this is a picture of Dillon Ward a couple of years ago as a Hamilton National, signing an autograph for my son (green hat). I’m wearing the red hat. I believe the woman in blue on the right is Mrs. Jeremy Thompson. Like I said, this was just an excellent game. End-to-end action in both directions and not a lot of play stoppages. At one point in the second, I’m sure play went on for five minutes with not a single whistle. Part of this was due to a non-NLL rule I’m really starting to like – the shot clock does not run when a shorthanded team has possession. This means that if you’re good enough, you can grab the ball early in the penalty you’re trying to kill, and just run around for two minutes. Maple Ridge did this twice, and it was awesome. In one case, the Burrards were killing a penalty and early in the penalty, the Chiefs got called for one, but the call was delayed because Maple Ridge had possession. Frankie Scigliano left the net and headed to the Burrards bench, but didn’t leave the floor. He stopped just short of the white line-change box, even pointing out to the ref that he was not in the box. The Burrards did not send an extra attacker out, presumably because the shot clock would have started. Instead, Frankie stood next to the bench for the full two minutes while the team killed the penalty (though he did grab a drink of water). With only a few seconds left in the penalty, the Burrards scored to negate the Chiefs delayed penalty. It seems weird that while killing a penalty, the Burrards seemed to have the advantage. Game four just ended a short while ago, with the Chiefs winning by the same 9-7 score, though not in OT. That one was also tied five times. Clearly Maple Ridge is not the pushover many thought they’d be. I much preferred the Burrards white jerseys to the dark blue ones they wore in Game 2. In overtime, Dan Dawson was being covered by two defenders when someone sent him a pass. It appeared that he didn’t even see the pass coming until it was halfway there, and then nonchalantly caught it with one hand on the stick. Travis Irving took a tripping penalty in overtime which didn’t look like tripping to me. He and whoever he “tripped” just got their feet tangled up together and they both fell. Then Kevin Reid took a holding penalty that was pretty cheap as well. (“cheap” meaning it might have been technically holding since he grabbed Cody Jamieson’s jersey, but just for a second and it didn’t slow Jamieson down one iota.) IMHO, neither of these should have been called penalties, especially in overtime of a game where they weren’t calling much. Putting the Burrards on the PK for half of overtime for these kind of penalties was kind of unfair. I sat across from the Maple Ridge bench rather than down in the end like game 2, and actually had phone and internet service… at least sometimes. For most of the game, the internet didn’t work while the phone was in my hand but once I put it in my pocket, it updated. Perhaps I can expand on that a little. I don’t follow the MSL or WLA all that closely, but close enough to know that (a) the Six Nations Chiefs were expected to challenge for the right to represent their league in the Mann Cup, and (b) the Maple Ridge Burrards were not. They even got into… um… penalty trouble earlier this year, but not only pulled through that but made everyone forget about it. While watching the warmups before the game, I was once again floored at the number of familiar names on the Chiefs. The Dawsons. Dillon Ward. Stephen Keogh. Ryan Benesch. Dhane Smith. Jeremy Thompson. Sid Smith. Brodie Merrill. Randy Staats. David Brock. Dan Coates. Ethan O’Connor (which is spelled wrong on his jersey). That’s a pretty impressive lineup of NLL stars right there – and that’s with Cody Jamieson, Billy Dee Smith, Jordan Durston, and Craig Point out of the lineup. Include a number of non-NLL players (including Randy Staats’s little brother Austin) and you have a pretty powerful team. On the other hand, you have the Maple Ridge Burrards, who aren’t nearly the stacked team the Chiefs are. No disrespect to a guy like Ben McIntosh, who I’d take on my team in a heartbeat, or goalie Frankie Scigliano, or other solid NLL guys like Creighton Reid, Jarrett Davis, and Riley Loewen, but the Chiefs have five players who were the in the top 2 in scoring on their NLL team last year and Dillon Ward is up for Goalie of the Year and Jeremy Thompson is up for Transition Player of the Year. 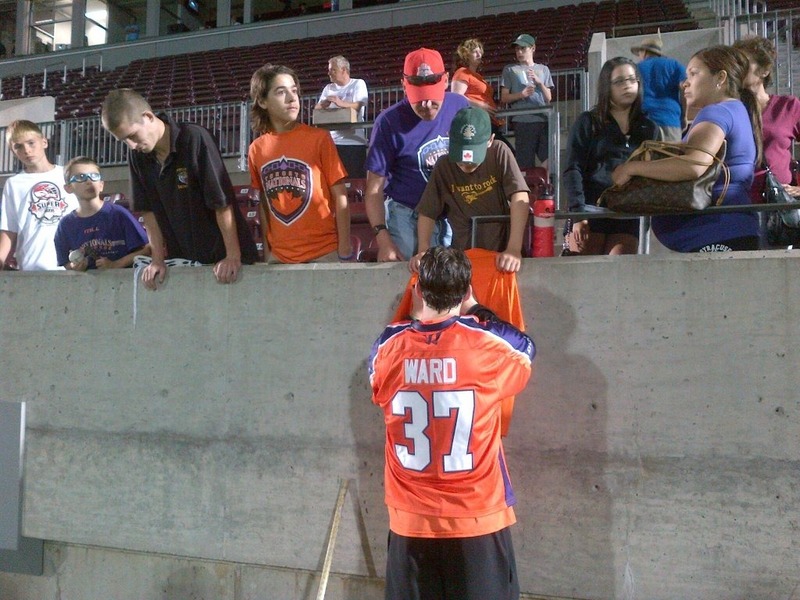 No Burrards were in the top 2 on any NLL teams last year and none are up for any NLL awards. In addition, the Chiefs seem to be the strong favourites to win the series. Some predicted that the Burrards wouldn’t win a single period, let alone a game. But the Burrards don’t care about any of that. They won the WLA because they played well as a team, and they won game 2 for the same reason. They moved the ball around well and took well-timed and accurate shots, while it seemed that the Chiefs fired anything and everything at Frankie Scigliano. From the buzz on Twitter, Frankie has been stellar for the Burrards over the playoffs and Saturday night was no exception. He allowed one goal on 19 shots in the first period and three on 22 shots in the second. Other than a five-minute lapse in the third, Frankie was in control all night. Dillon Ward wasn’t seeing the ball so well, though he was far from terrible. He was pulled a couple of minutes into the third for Doug Jamieson, who I assume is related to Cody. Jamieson played OK and along with the 4-goal run in the third, helped to give the Six Nations faithful some hope for a big comeback. But the Chiefs got into some penalty trouble of their own late in the third which allowed the Burrards to kill time and end the comeback bid. It seemed to me that the Chiefs, other than Ryan Benesch, were all really big and the Burrards were not. Looking over the roster on the Burrards web site, most of their players are in the 5’11” – 6’2″ range, with a couple of 6’4″s and a 6’5″, so pretty much what you’d expect from a lacrosse team. There are a couple of guys named Porter who are Josh Sanderson-sized, but gritty and quick. It seemed that those guys were everywhere. On the other hand, the Chiefs seemed to have Beni and a bunch of guys 6’3″ and bigger. I’m sure most of that is seeing Dan Dawson, Paul Dawson, Brodie Merrill, and Dhane Smith together – those guys look like they belong on a basketball team, not a lacrosse team. I’m sure in reality it’s not as uneven as it seemed. Not that it mattered. I’m heading back to the ILA for game three on Monday night, but I won’t be able to make games four, five, or six. I don’t have a particular rooting interest, so I’m rooting for a seven game series. If it goes to game seven, I’m there. I need a CLA rule book. It seemed that sometimes the team had to get the ball out of their end in 10 seconds, other times they didn’t. Over and back wasn’t called most of the time, but I think it was once or twice. In the third, the Burrards got a tripping penalty, and then got a bench minor which was served by DJ Saari. The Chiefs scored on the 5-on-3, which ended the tripping penalty, but Saari came out of the box. The ILA is weird. There are places that I’ve sat in the arena and had internet service on my phone, though kind of spotty. In other areas of the arena, I don’t even have phone service, let alone internet. After his 2nd intermission interview, Dan Dawson left the floor and walked through a bunch of kids, then turned around and came back to give them all fist bumps. Classy. The shot clock whistle is really loud. All three media timeouts took place at 9:45 of the period. I went to a party recently hosted by my friends Doug & Ashley at their new house in Orangeville, a small town (population about 28,000) about an hour from my place. Other than stopping at Tim Horton’s a couple of times on my way to or from Collingwood, I had never been to Orangeville. But if you follow lacrosse at all, it’s hard not to know the significance of this town in lacrosse culture. At the party, I estimated that more NLL players come from Orangeville than any other single town, with the possible exception of Peterborough. It turns out that I was mostly right; from the 2016 rosters, Orangeville and Coquitlam BC each had 13 players in the NLL. Peterborough and St. Catharines had 12 each. But Coquitlam, Peterborough, and St. Catharines each have four times the population of Orangeville. Even much bigger cities like Toronto or Hamilton don’t have the same numbers. Hamilton has almost twenty times the population of Orangeville but only had 7 NLL players in 2016, and that’s if you include Stoney Creek, Dundas, and Millgrove. But bigger cities certainly don’t have the same sense of community – two players may both have been brought up in Toronto but rarely played against each other, where that’s just not possible in smaller towns where everybody knows everybody. 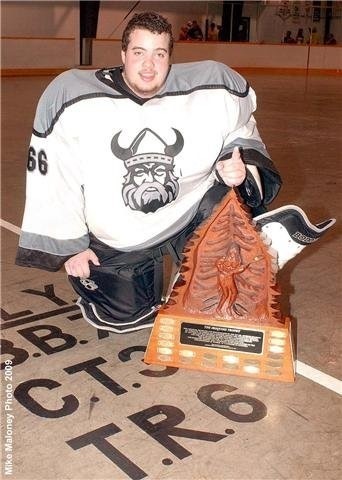 Many NLL fans know about the Sanderson family’s connection to Orangeville. Indeed, Sanderson’s Source for Sports (formerly owned by Terry Sanderson and now, presumably, by Josh) is right there on Broadway. Six different Sandersons have played in the NLL (Brandon, Josh, Nate, Phil, Ryan, and the late Chris; all but Nate played at the same time in 2002-2003) and two more (Terry and Lindsay) have coached. But considering the size of the town, the number of lacrosse players that have come from the ‘Ville is astounding. Obviously we have the Sandersons. Pat Coyle. Brodie and Patrick Merrill (though Patrick was born in Montreal). Jon and Greg Harnett. Jason and Jeremy Noble. Glen Bryan. Andrew Suitor. Bruce Codd. Rusty Kruger. Brandon Miller and his late brother Kyle, who never played in the NLL but was a great field lacrosse goaltender. Dillon Ward. Evan and Mike Kirk. And one of Orangeville’s (and particularly the Orangeville Northmen’s) greatest promoters, Nick Rose. I’ve probably missed some. It’s not just that there are a lot of players from Orangeville, there are a lot of great players. The list above contains three NLL Hall of Famers (Josh, T, and Coyle) and at least one future HoF’er in Brodie Merrill. The 2016 finalists for the NLL Goaltender of the Year award are Rose, Ward, and Evan Kirk who all played for the Northmen. While driving into the town on my way to the party, I passed Sanderson’s and when I turned off of Broadway, I saw a sign pointing to the Tony Rose Memorial Sports Centre. This is where all the different Northmen teams play and was named for Nick’s father. It turned out that Doug and Ashley can see the “bunny barn” from their deck. I tried to impart on them the significance of this but they’re not huge lacrosse fans (or at least not as big as me) so its meaning was kind of lost. But even though they’ve only lived there for a matter of months, they’ve noticed people playing lacrosse everywhere. It’s a part of Orangeville culture. Only two other towns in Canada even come close to Orangeville’s production in terms of great lacrosse players per capita. One would be Victoria BC. The population of Victoria is around 78,000, only double that of Orangeville. But Vic had seven NLL players in 2016, and many great players have come out of the BC capital, including the Gaits, Tom Marechek, Ryan Ward, Kevin Alexander, and last year’s Tom Borrelli award winner, Teddy Jenner. The other is a different entity altogether. The Six Nations reserve in southern Ontario has a population of around 26,000, about the same as Orangeville. Nine players in 2016 called Six Nations home, and many other NLL players in the past have grown up there. The names Bomberry and Powless are all over the history of the NLL and lacrosse in general, and there’s a Bomberry and two Powlesses playing now. I’m guessing you’ll hear those names as well as names like Jamieson and Staats in the NLL many times in the coming years. I called it a “different entity” because as much as lacrosse is a part of Orangeville culture, it’s even more ingrained in Native culture. It’s not just a fun game to play to pass the time or a game you play because everyone else plays it, it’s part of their belief system. But that’s an article for another day.